If you have been here with me for very long, you will remember me frequently mentioning my dad's relative who passed down many of our family heirlooms. 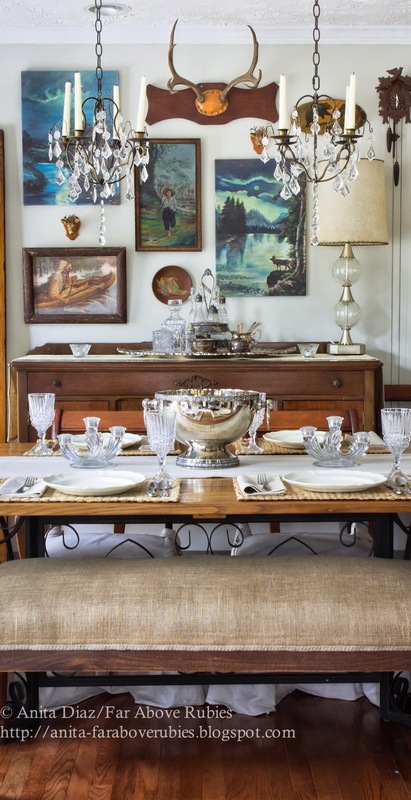 So much of my furniture, art, china, etc., came from our "Cousin Ruth," and each piece is treasured. 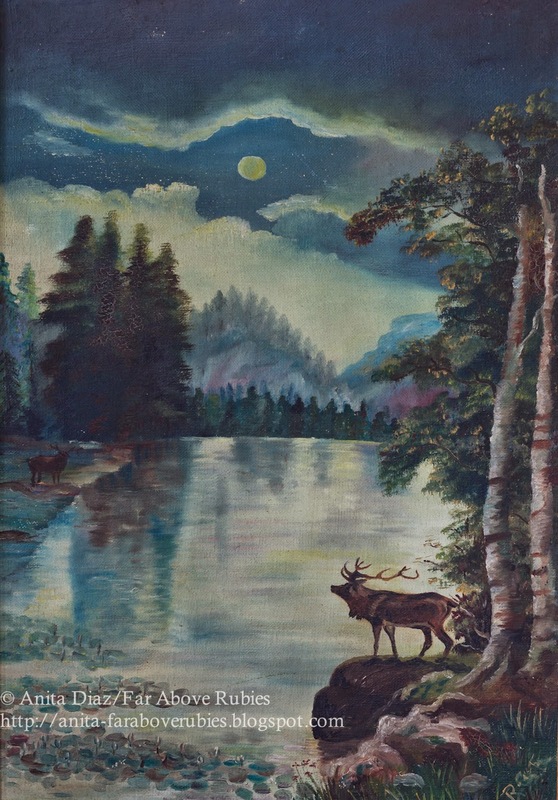 She was also an artist and I fell in love with a couple of paintings my mother had over her fireplace. 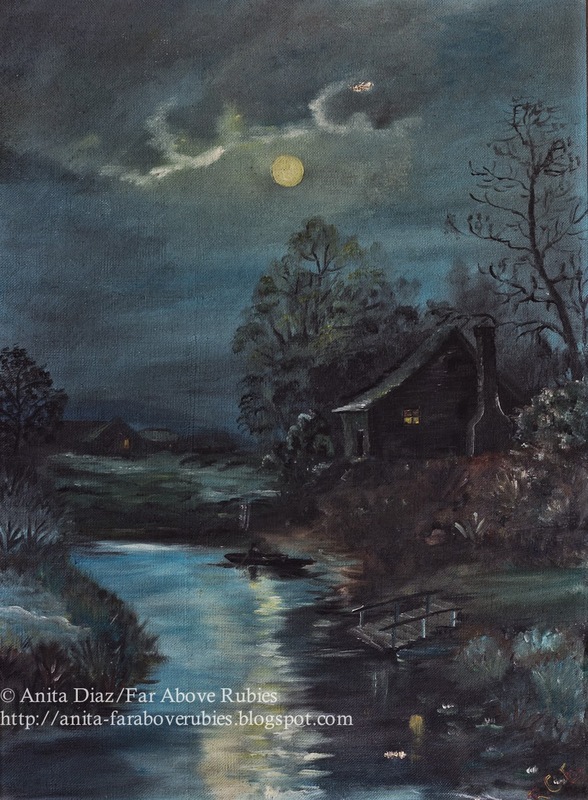 They were painted when Ruth was a young lady in finishing school in the 1920s. There is something I absolutely love about these paintings. The scenes they depict could be here in our area, and the country aspect I just adore. Since my mother was using the paintings, I had planned to photograph them and have them made into canvases. Because the originals were very dark, I lightened them up a bit for printing and really had no idea how they would come out, but was really pleased with the results and decided to use them in a gallery wall over Ruth's antique buffet. 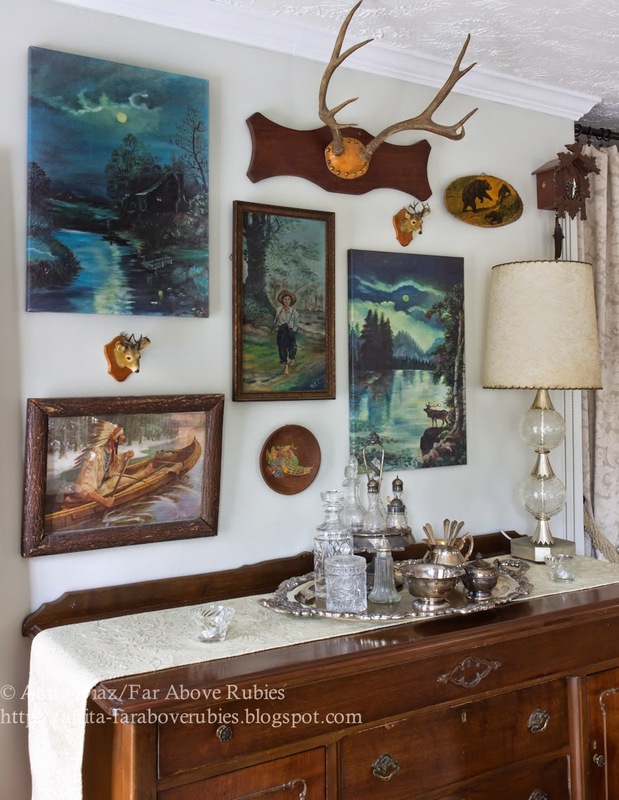 I had also been looking for the little deer heads my grandmother always had on her mantel, and amazingly, my mother found them in the basement. I knew these would be perfect with the woodsy feel that was taking shape. I added a print my grandfather framed in 1926 to the mix. The boy painting is also one of the first Ruth did, and I love having the texture of the frame mixed with the canvases. I added the other deer head above another canvas of Ruth's work. The antique lamp also belonged to Ruth, and I'm so happy to have it here in this vignette. I could not be more pleased with how my gallery wall turned out and I am really enjoying just looking at everything. I deliberately chose mostly large things with just a few small accents so it didn't look too cluttered. I also chose not to let it get too symmetrical...because I wanted to keep it interesting and keep the eye moving. What an easy project this was to accomplish, and it really makes a big difference on this wall. Your gallery wall is stunning. It must be incredible to have such an accomplished family, and it's easy to see where you get your own various and unique creative talents. 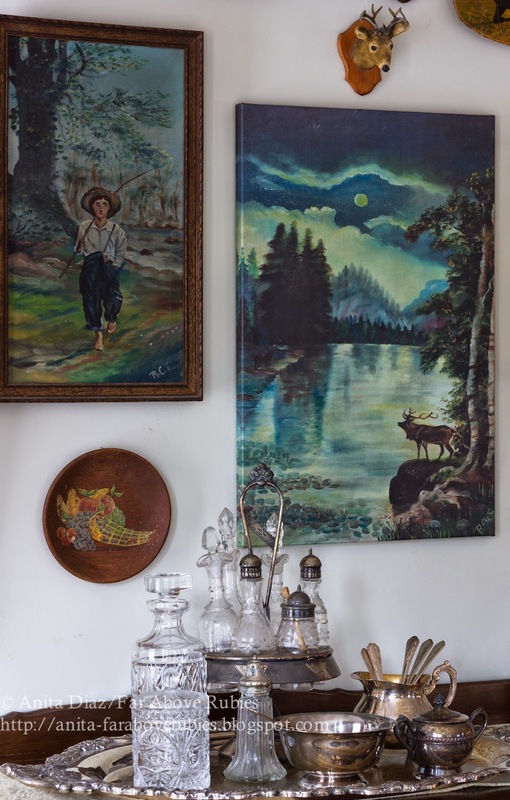 The paintings are so moody in a very lovely way, and the items you've chosen to hang with them make a wonderful collection. Thank you Laurel so much:-) They are dark and moody, and I guess that is why I love them so much. I will show you all soon where the actual paintings are now that my mother let me have both of them!! Thank you Kathleen! I'm sure they are beautiful! 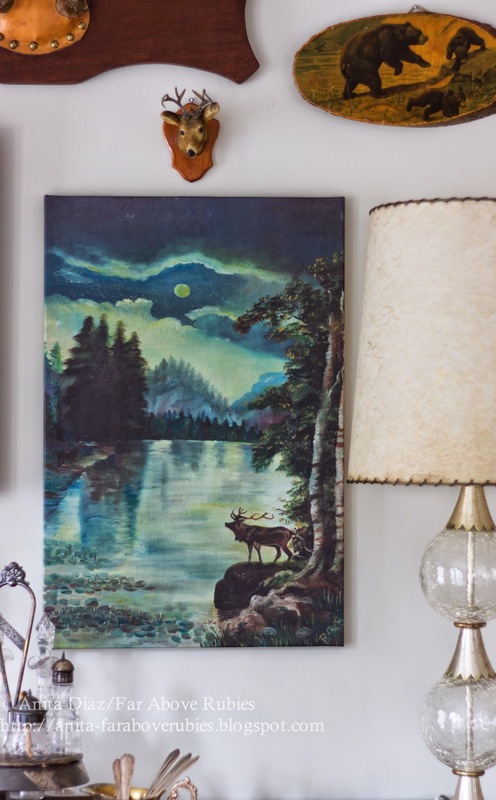 I love the old vintage landscapes -- I collect them and use them in a collage in our lake cottage. 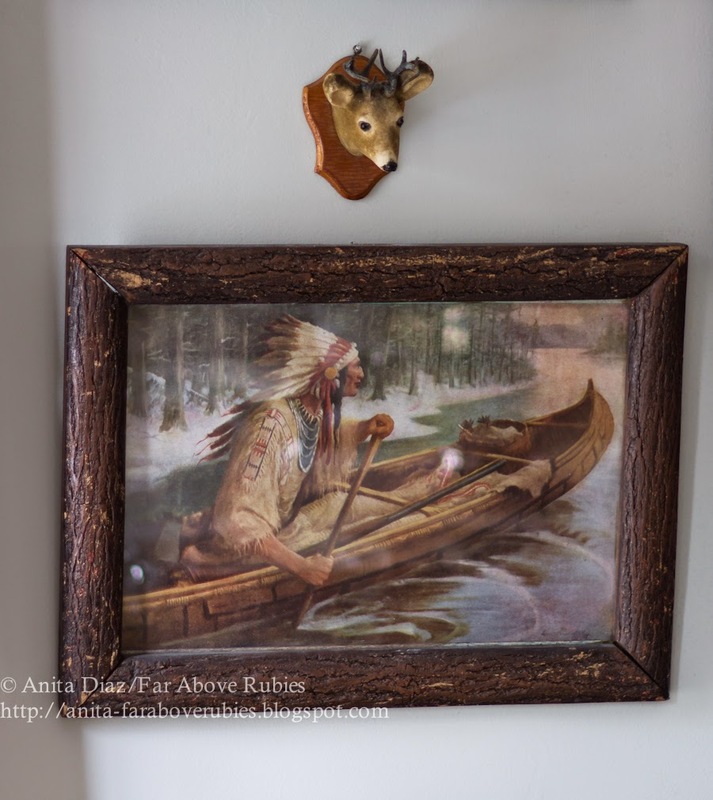 Your addition of the deer heads is perfect with them, and, certainly, the fact that they were painted by a family member makes them even more special. I love your arrangement! I love gallery walls, but I've always had a hard time finding inspiration for a more rustic one. 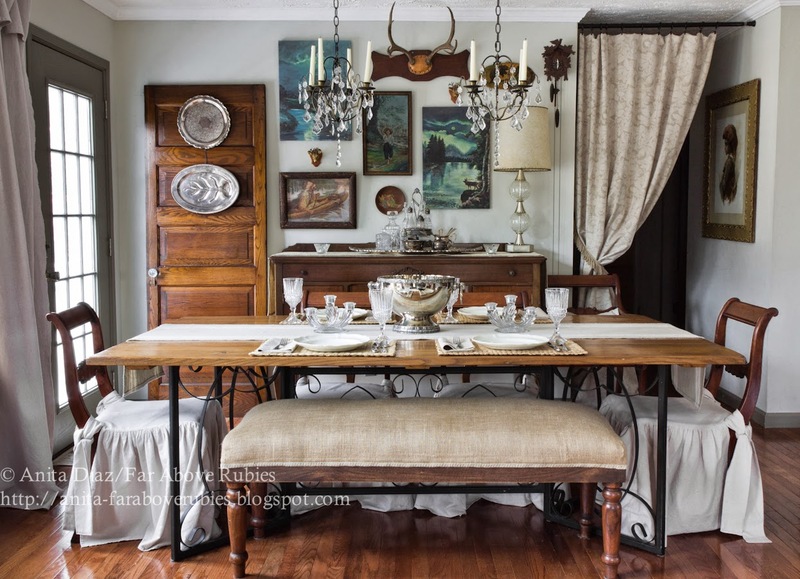 This is absolutely perfect & I can't wait to try it down the long hall in our home! Thanks Jordyn, and I am sure you would come up with an amazing one!! 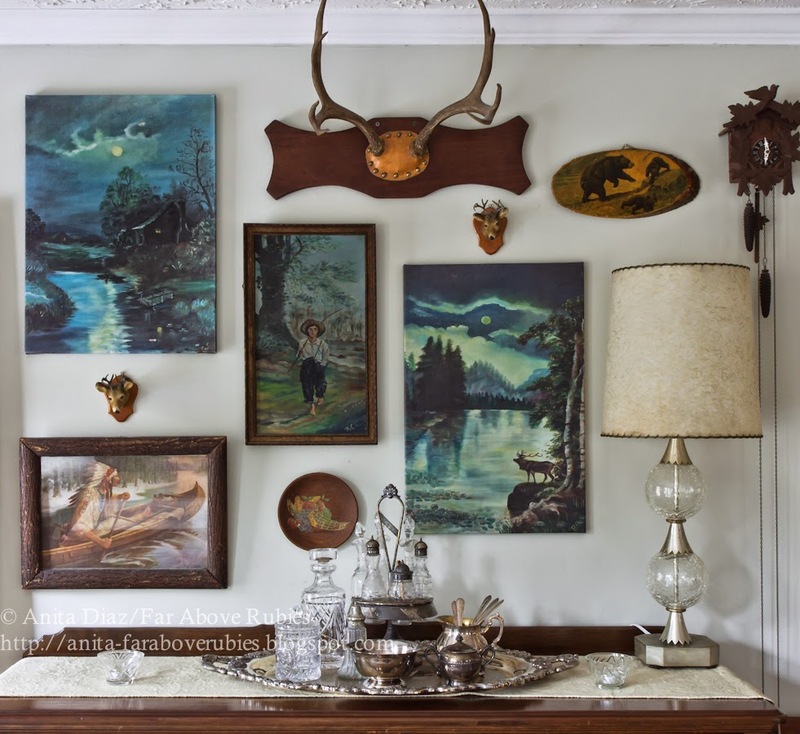 How so very special and beautiful your gallery wall is Anita....What a thrill it must be for you to have such precious family heirlooms that you can enjoy every day in that most beautiful art...and those little deer heads are great! Thank you Shirley! It was amazing my mother found them because we both just knew they had been thrown out. Anita, I feel certain you and I would be the best of partners in decorating crime if we lived closer to each other. This is fantastic! I just love it, and it works effortlessly to add charm to your home. I worked hard before Thanksgiving to complete a family gallery wall in our library. 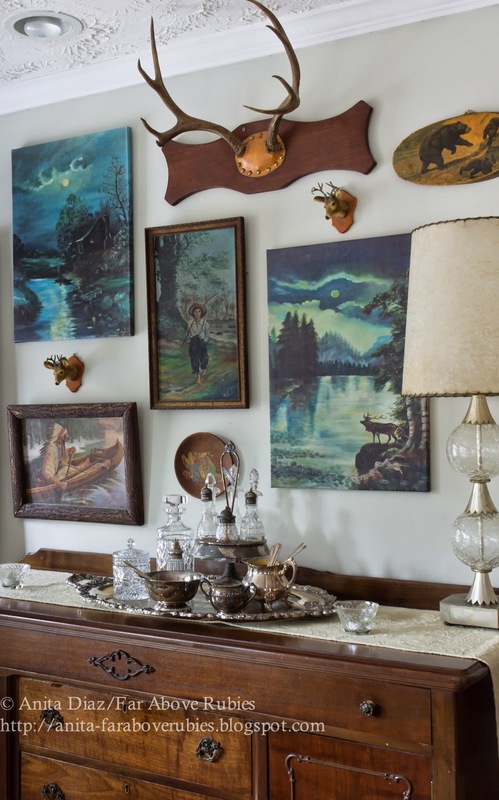 Like you, I cherish pieces of our family history and do whatever I can to incorporate those pieces into our home decor. The canvases are priceless, and they add a billion percent character, charm and family value to your dining space! I have big pkans for several other gallery areas in our home as soon as I am up and around again. Seeing this just makes me more enthused about the projects than ever! Laurel's comment is exactly what I am thinking. Your entire family seems so creatively talented. I really like your arrangement, you have an eye for detail and balance. And it the wall looks so perfect in your pretty dining area! Many accolades to your cousin Ruth! You have one charming display...lovin' how you put it all together.